This disease is of rare occurrence in the adult horse, and more prevalent in tropical climates than in Europe. 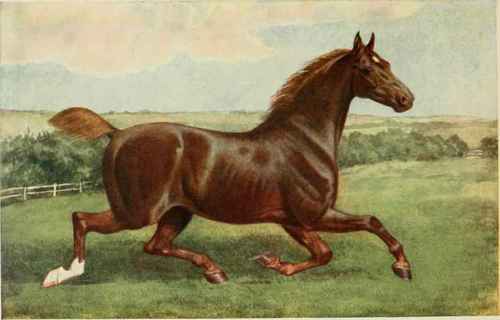 The reason for this difference is no doubt to be found in the much-higher temperature to which horses are exposed in the one as compared with the other. In foals it is by no means rare in this country as the result of causes presently to be referred to. Besides the causes named, inflammation of the liver may also arise from external violence, as from a blow over the region of the organ; and there can be no doubt that in rare instances it also follows upon exposure to cold, especially in animals which occupy warm stables and are overfed and underworked. In acute hepatitis the patient exhibits a dull, heavy appearance. The head hangs low, the eyelids droop, and the face wears an expression of drowsiness. As a rule the membranes of the eye, the nose, and the mouth are more or less yellow. The urine is dark in colour, emits an offensive odour, and throws down on standing a dirty-looking deposit. In some instances there is diarrhoea, and in others constipation, or both these conditions may exist in the same animals at different times. The motions when hard are glazed, or coated with a layer of sticky mucus. Deep pressure in the right flank may cause the animal to wince, and pain is further manifested by the head being occasionally turned in that direction. The mouth is hot and clammy, and fever is present in proportion to the severity of the disorder. As a rule, acute inflammation of the liver owes its origin to disease existing in some neighbouring or remote organ, from which the blood becomes contaminated with septic or putrid matter from some unhealthy wound or abscess. In the adult, ulceration of the bowels, or the stomach, is the more common source of such matter, and from these organs it is readily transferred by means of the blood-vessels into the liver, there to irritate and inflame the gland and provoke the formation of abscess. In foals it is most frequently seen in connection with that destructive malady commonly termed "joint ill". Here the wound at the seat of the navel becomes foul and unhealthy, and organisms of putrefaction gain entrance to the liver by following the track of the blood-vessels connecting the one with the other. Consideration of the nature and origin of the disease affords but little encouragement to hope for the complete success of treatment, whatever benefit may be derived from it, and practical experience bears out this view of the question. At the outset it will be necessary to promote a free action of the bowels, and this may be done by the administration of a dose of sulphate of magnesia, to be followed by the daily administration of a quantity sufficient to maintain a reasonable action of the bowels. Ipecacuanha, by promoting the action of the skin and unloading the liver of bile, will materially aid in relieving the affected organ. A sharp blister over the right side of the belly should be promptly applied, and the body should be warmly clad in rugs and bandages. To withhold all food for twenty-four hours will be a distinct benefit to the patient, and so long as the acute symptoms continue he should be restricted to a soft or liquid diet. Sire, Denmark 177; dam, Jenny Bother em by Fireaway 249. The Property of F. J. Batchelor, Esq.